Jessica had earned her master’s degree in sociology and was in Kenya engaging in Ph.D. dissertation fieldwork when she lost her life after being struck by a car on August 28, 2004. Family, friends, and colleagues established the Jessica Roy Memorial Award in 2005 to honor the memory of UCSC graduate student Jessica Roy. Jessica had earned her master’s degree in sociology and was in Kenya engaging in Ph.D. dissertation fieldwork when she lost her life after being struck by a car on August 28, 2004. Her parents survive her, along with her brother Nathan and his young family, who all live in New England. She was 28 at the time of her passing. 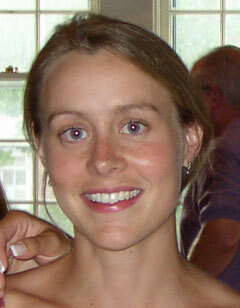 Jessica lived a very full life; she was an active student, athlete, and volunteer. Prior to coming to UCSC she graduated from Philips Exeter Academy in New Hampshire and Davidson College in North Carolina. While at Davidson she volunteered in a variety of endeavors, including tutoring Native American children, volunteering at an orphanage in Haiti, assisting in supplying medicine and medical support in Cameroon, and working at a raptor center. Jessica’s personal interest in running, hiking, camping, and wildlife are what first brought her to Kenya in 1998 to attend the School for Field Studies and then to work as a raptor biologist for several months. Her professional passions were water and women: her Ph.D. work focused on how success factors for social organization of water users’ groups, how the poor and women can be included in such groups, and how women and the poor are affected by lack of safe water and by improved access to safe water. Her approach was interdisciplinary, including environmental, feminist, and sociological perspectives. The Jessica Roy Memorial Award Fund, a permanent endowment, provides funding for an annual award for one or more graduate students. Preference is given to students within any department who have a demonstrated interest in or are pursuing studies focusing on the equitable distribution of natural resources in international development, especially as that equity applies to women. The award, which is based on academic merit, is intended to provide its winners with stipends to support fieldwork travel and research For more information regarding this award, please contact the Sociology Department at 831-459-2831 or visit their website.